How it works : we will prepare a report on your property for last 12 months and compare with current month's bookings after you switch to update247. If there is no improvement, then you pay $0 subscription fee to Update247 for that month. Offer is only available to new signups. Suitable for Bed & Breakfasts, Guesthouses and Small Hotels and accommodation of all sizes from single unit to larger hotels and accommodation groups of more than 100 rooms. Your monthly subscription (no lock-in contract) comes with the use of channel manager (manage room availability and rates to channel sites) and book now button that goes on your website so that you can receive online direct bookings (Commission Free Bookings). Payment gateway can also be setup with the book now button so that it can automatically process payment when a booking is received. You can also add promotions like "Stay 3 Nights Get 1 Night Free" or "20% OFF Direct Booking" on your own book now button to attract more direct bookings and pay NO COMMISSION. Easily setup promo codes to track your adwords conversion etc. in our easy to use online systems. You can access update247 via internet from anywhere in the world. 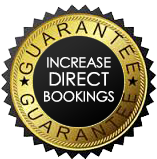 Take advantage of the traffic to your own website and receive instant bookings and pay no commission!